CIM Group has begun construction of an eight-story, residential development featuring 333 apartments and ground floor retail at 40 Harrison St at Jack London Square, a 12-acre entertainment and business destination on Oakland’s waterfront. The development site is bounded by Embarcadero West, Alice Street, and Harrison Street, and is also adjacent to the San Francisco Bay Trail. The building is anticipated to be completed at the end of 2020. The apartment building’s architectural design takes full advantage of its waterfront location with a glass façade providing sweeping bay views, balconies, and landscaped courtyards. 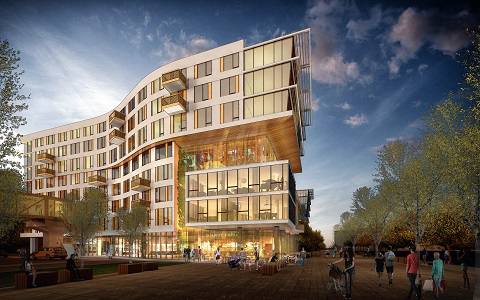 The building will offer a host of on-site amenities including communal gathering spots, outdoor terraces and lounges, fitness center, and a bike storage and care facility, with residences configured as studio, one- two- and three-bedroom floor plans. It will also include 2.4k sf of ground floor retail that will further enliven the pedestrian street experience. In March 2016, CIM Group acquired seven buildings of Jack London Square that included three office buildings with ground and second floor retail; three retail buildings; a parking structure with ground floor retail; and three land parcels including 40 Harrison Street. The construction of new residences and ongoing leasing activities at Jack London Square continues CIM’s program to bring a complementary mix of uses and offerings that appeal to residents, visitors, and tenants. 40 Harrison Street will add to the vibrancy of the area’s many shopping, dining, entertainment, and recreation options, which includes CIM’s new retail leases with Tartine Bakery’s Coffee Manufactory, Grocery Café, and Oaklandish as well as Belcampo restaurant currently under construction, expanding Jack London Square’s exceptional array of restaurants and shops. CIM has been involved in the Greater Bay area since 2001. The firm’s first Oakland acquisition took place in 2007, and in 2008 it acquired a 1.7 msf portfolio of Class A office properties in the Lake Merritt and City Center districts. Most recently CIM acquired Uptown Station, a redevelopment of a former department store to a 355k sf office building, with significant ground floor retail located in the Uptown district of downtown Oakland, and 1100 Clay Street, a development parcel, where CIM is building a 16-story, 288-unit apartment building. Currently, the company’s Oakland portfolio is comprised of approximately 3 msf that includes a variety of Class A commercial properties.